In this step, you will use the XML Binding Wizard to create the inbound request binding iiiPRO05_request.jar which will bind the inbound XML that the server receives. 1. From the Studio Project tab, select the XML List Request solution. Right click to create a New Solution, a dialog will appear. a. 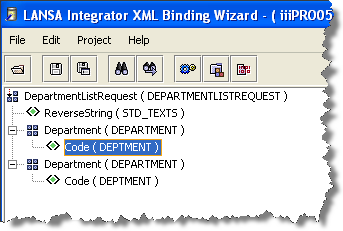 Select the XML Binding Wizard from the Tool dropdown. b. XML List Request should already be selected in the Group dropdown. c. Type iiiPRO05_request in the Solution File input field. Click OK.
2. A new XML Binding Project panel appears. To select the source XML file, click on the Browse button. A File Open dialog will be displayed. b. Check the Inbound checkbox. An Inbound tab will now appear at the bottom of the window. a. Select the Inbound tab. b. Right click on the DepartmentListRequest root tag. Select Fragment from the pop-up menu. c. Right click on ReverseString tag and select Edit from the pop-up menu (or double click on it). d. In the Field Attributes dialog, type in STD_TEXTS for the Name and click OK.
e. Right click on either of the Department tags and select List. This will define both tags, as well as any sub-tags in the hierarchy, as members of a list. f. Expand the Department tags to see their sub-tags. Right click or double click on either of the Code tags to edit them. g. In the Field Attributes dialog, type in DEPTMENT for the Name and click OK. Notice how editing one of the sub-tags in the list automatically edits all occurrences of that tag in the list. 5. Now, create the inbound request jar. Select the Project menu and choose the Build option or use the Build toolbar button. 6. Using the File menu, select the Save option or use the Save toolbar button. Click on Yes to save the project. 7. Exit the XML Binding Wizard.